The 25th class of Honored Members of the FHS Hall of Fame were inducted in a ceremony after the annual banquet at the Century House on Sunday, July 1, 2018 in front of a large crowd who also saw two Boys' Basketball Teams recognized for their memorable seasons in 1966-67, and 1967-68. 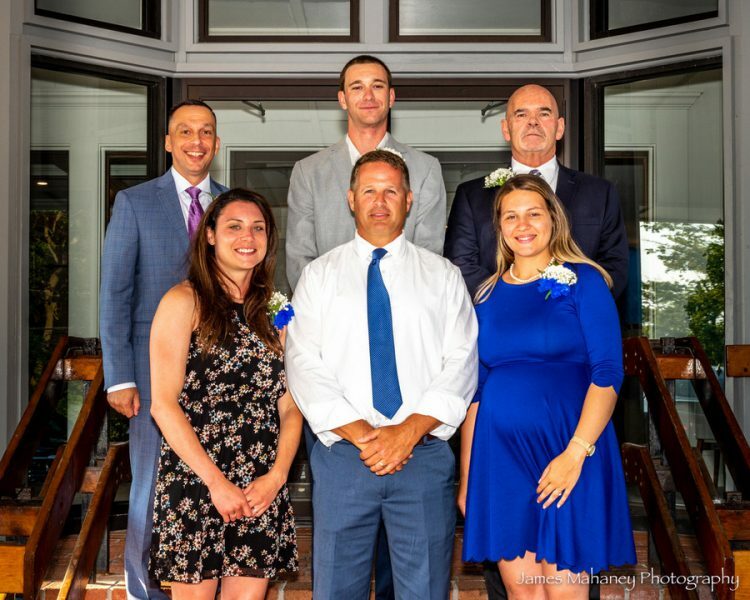 Growing up in a town where your father is a legendary high school basketball coach can be difficult, but Dave Brogioli flourished as a student athlete while at Wareham High School. When it came time for Dave to create his own legacy as a coach, he chose a rival South Coast Conference school, the Fairhaven Blue Devils. Coach B. (as he was known to his players) started his Fairhaven coaching tenure as an Assistant Boys’ Basketball Coach. He quickly earned the respect of his players based on his knowledge of the game and the ease with which he developed positive relationships. Coach B would also add football to his coaching resume, and in 2000 he was a part of the coaching staff of the FHS football Super Bowl winning team. In 2001, Dave became the Varsity Girls’ Basketball Coach, and for the next 7 seasons the Blue Devils would see unprecedented success. From 2001-2008, he compiled a gaudy record of 105-38. In the 2007 and 2008 seasons, he led the Lady Devils to the school’s first S.C.C. titles, with one of teams completing an undefeated conference record. Those two years would also see the Devils make deep runs all the way to the South Sectional finals. Ask any of Coach B.’s players from those seven seasons and they will tell you stories of a coach that would encourage, motivate, and inspire his players. He worked tirelessly to get his players so prepared and mentally tough that they believed they would dominate every opponent. At the beginning of each season, Dave wouldn’t shy away from the ultimate goal, a State Championship, and although they would fall just short several times, his players knew that they had left all they had on the court. Off the court, Coach B. would also always have the best interests of his players, this included nominating players for various awards, sending highlight videos to colleges for recruiting purposes, hosting team dinners at his house, and always checking on players who had suffered an injury and couldn’t get on the court. Although Coach Brogioli has moved on to coach different high school girls’ basketball teams, the stamp he left on the Fairhaven program will be felt for years to come. Both on and off the field, Edward “Boo” Bouley was known for his ardent spirit and noteworthy leadership. Eddie spent his high school career on the football, baseball and track and field teams. He was a four-year member of both the baseball and football teams, but it was on the football field where he earned most of his athletic achievements. As a three-year starter as a two-way lineman for the Blue Devils Varsity Football Team (1970-1972), Eddie’s tenacity on the field made him a vital member of the team and a valuable left offensive tackle that every quarterback needs and appreciates. Not only was Ed an asset to the offense, but his contribution to the defense, splitting his time between the defensive line and line backing positions, was crucial to his team’s success.. His presence and tenacity helped to lead FHS to South Coast Conference championships in 1971 and 1972. Eddie is best known for being a quiet leader who led by example. His hard work, dedication and toughness were an inspiration to his teammates. Apart for having the size and athleticism to be a dominating player, Eddie was celebrated for his determination and leadership. In addition to being praised by both coaches and teammates, Eddie was recognized as a two-time member of both the All-Conference and elite All-Suburban teams and received honorable mention on the Boston Globe’s All-Scholastic Division III Team. Despite playing “in the trenches” both ways and even changing his position in his senior year, Ed excelled and set an example for his teammates. Furthermore, Eddie shined as a first baseman on the Varsity Baseball team and even found some success on the Fairhaven High School Track Team. After his tenure at Fairhaven High School, Eddie went on to play football as a postgraduate at the prestigious Milford Academy in Connecticut and then attended the University of Maine where he continued to play football. Upon returning to the South Coast, Eddie spent fifteen years scalloping out of the Port of New Bedford. He is a recently retired Lieutenant of the Bristol County Sherriff’s Office. While academics came easy to Lyle, running did not and he had work hard to improve his performance. Despite finishing at the bottom of every meet during his freshman year, he worked tirelessly in the off season and by the time he was a senior, Lyle finished in the Top 25% of every meet. That work ethic and dedication amplified his results in the classroom. As a result, he graduated as the Valedictorian of the Class of 1990. He headed to Purdue University with an Air Force ROTC scholarship, graduated with a degree in Food Process Engineering and earned a commission in the U.S. Air Force. For 23 years, he has been serving from coast to coast and around the world in acquisition program management, professional military education, and aircraft maintenance in Massachusetts, California, Alabama, Arizona, Korea, Capitol Hill, Haiti, Iraq, the Pentagon, and New Mexico. However, he never forgot what allowed him the opportunity to do all this. In 2012, Lyle saw the opportunity to give back to a program that bolstered his confidence and instilled a strong work ethic in him. He created the West Island 5K to infuse finds into the FHS cross country program and honor a former FHS athlete and cross country coach, Crispin Demers. Over the past 7 years, the event has raised over $70,000 through the support of community sponsors and over 4,000 participants. The proceeds funded the Crispin Demers Memorial scholarship and continue to fund scholarships for graduating cross country seniors and improvements for the program, scholarships for the West Island Improvement Association, and events at Hastings Middle School. As a result of the race’s tremendous success, Lyle partnered with an Air Force colleague and started the nonprofit, Strive and Achieve. Strive and Achieve increases the awareness and promotes skilled labor career fields while providing scholarships each year to young Americans dedicated to that endeavor. For three winter seasons from 1988 – 1991 Christopher Butler was the dominant big man on the Blue Devil basketball team. He began his Varsity career as a 6’ 4” sophomore and had a good season scoring 166 points for a team that finished 8-12 in Hall of Fame Coach Bob Baldwin’s first season. Chris had a breakout season during his junior year for the Blue Devils. He averaged 17 points per game and led his team back into the post season State Tournament with a 13-8 record. His outstanding play caught the attention of many New England D-II colleges, and Chris decided to make an early decision and accept a full scholarship to Stonehill College. With the pressure of making a college decision removed so early, Chris was able to keep his focus completely on the basketball court during his senior season. He had now developed into a 6’ 7” dominating post player, and fulfilled all of his potential as a complete basketball player. In his last regular season game Chris scored 30 points against Dartmouth to set the stage for Fairhaven’s run in the State Tournament in Division II. Chris had averaged 18 points and 11 rebounds per game leading his team to a 16-4 record and a co-championship in the South Coast Conference with Apponequet and Seekonk. The Blue Devils opened the post-season with a 60-50 home victory against their conference rival Apponequet, with sophomore Nate Pickup scoring 29 points and Chris adding 18 points and 17 rebounds to the cause. Next up was a tough road game at number two seeded Rockland. Fairhaven fell behind 18-5 in front of a very hostile crowd, and then came charging back to take a five point lead at half-time. They held on to beat Rockland 55-51 with Chris scoring 18 points to go along with 12 rebounds. The South Sectional Semi-Final matchup was in Brockton against #3 seeded Jeremiah Burke and it was a battle. Burke won the game 61-54 but Chris ended his high school career with a 25 point / 15 rebound effort. The Blue Devils finished their terrific season with a record of 18-5. Chris Butler had capped off his high school career with his best individual season statistically which left him with 920 career points, and a member of every area All-Star Team as well. He was also chosen as the winner of the annual Dave Cowens Award in 1991 given to the outstanding high school basketball player in Southeastern Massachusetts. Coach Baldwin states that “Chris was a coach’s dream. He was dedicated, unselfish and extremely motivated to make himself and his team better”. Chris Butler went on to have an outstanding career on the Division II collegiate level with Stonehill College in Easton, MA where he became a 1,000 point scorer. Throughout his athletic career at Fairhaven High School, Nick Motta excelled both on the football field and the basketball court thanks to his overall athleticism and drive. On the gridiron, Motta stepped in as the starting quarterback for the 2005 and 2006 seasons and excelled with a total of 11 touchdown passes and 17 running touchdowns. This included a win over GNB Voc-Tech in which Motta threw the game-winning touchdown with 9/10 of a second left to play. Recently in 2015, Motta was honored by the Standard Times as one of the twenty greatest Fairhaven football players of the past fifty years. In spite of his phenomenal success on the football field, it was on the basketball court where Motta achieved outstanding athletic achievements. Starting with his sophomore year (2004-2005), Motta become a standout on the court as both a leader and team player. With a total of 1,048 career points, it is believed that Motta holds the FHS record for points scored in one game with a total of 48 against Bourne in his senior year. He notably scored in double figures for 28 consecutive games. Although he shined as an offensive player with his pristine ball handling skills, Motta’s overall ability as a powerful rebounder and outstanding defender have been considered to be even more impressive. For a player standing at six feet, three inches, Motta always played against the opponent’s top offensive player and did an excellent job, which eventually led him and his team into the final tourney in both his junior and senior seasons. His efforts on the court were recognized when he received the prestigious Dave Cowens Basketball Achievement Award in 2007. Throughout his time at FHS, Motta was also an honor student and participated with both the baseball and track teams in the spring seasons. He ended up attending Bridgewater State University where he played basketball. For three consecutive years Nick was selected for the Men’s Basketball All-Conference Team in the Massachusetts State College Athletic Conference (MASCAC). Other highlights include three appearances in the NCAA Div. III Basketball Tournament, being one of the university’s top scorers of all time, winning the MASCAC Men’s Basketball Player of the Year in 2010 and being selected to play on the US Division III Basketball Team. In 2014 Nick went on to graduate from the Massachusetts Department of Corrections Recruit Training. He currently is in his fourth year of service as a Corrections Officer. During her time at Fairhaven High School, Erin Baldwin was an integral part of an emergence of excellence in both Girls’ Basketball and Volleyball. Erin’s four years at Fairhaven included conference championships in both basketball and volleyball and also deep runs into the state tournaments for each of those teams. The Girls’ Basketball team earned the first South Coast Conference championship in the school’s history during Erin’s junior season. In that same season, Erin helped lead the team to the first ever appearance in the Division 3 South Sectional Final. In her senior year of Volleyball, her team also made an appearance in the Division 3 South Sectional Final, while also winning the South Coast Conference with a 22-0 record. Her senior season of Basketball also included a South Coast Conference championship and an appearance in the Division 3 South Semi-finals. Erin’s combined record for her four years of Varsity Girls Basketball was an impressive 72-26. As staggering as the team accomplishments were for Erin her personal statistics in basketball were even more impressive. Erin was a four year starter for the Varsity Girls’ Basketball team and a three year starter for the Volleyball team. She was a four year South Coast Conference All-Star in basketball, and Erin was the Standard-Times Girls’ Basketball Player of the Year in both her junior and senior seasons. During her senior season of Basketball Erin averaged 15.3 points, 9.4 rebounds, 4.4 assists and 3.2 steals per game. At the conclusion of her senior season Erin also won the Dave Cowen’s Award given to the area’s best female basketball player. In the end, Erin finished with 1,466 points in her basketball career. The point total was enough to make Erin the all-time leading scorer in Fairhaven Basketball history, including both boys and girls. Kaleigh was bitten by the basketball bug at the age of five when she learned how to dribble and shoot at the YMCA. After developing her talents as a member of the St. Joseph’s (Fairhaven) team in the CYO League, the 5’7” standout was already battle-tested by the time she entered Fairhaven High School. After devoting her freshman and sophomore seasons to polishing her basketball skills, Kaleigh was ready to shine in her final two seasons, and teaming with Erin Baldwin and Maggie Rossi, the “Big 3” led the Blue Devils to back-to-back South Coast Conference championships, as well as the South Sectional Division III Finals in her junior year (200-2007). Despite her lack of size, Kaleigh was asked to play inside, and she responded by leading the ‘06-‘07 team in rebounding, averaging 9.8 per game. While Baldwin and Rossi each averaged double figure points per game to lead the team’s scoring, Kaleigh averaged a shade under 10 points with most of those points coming as a result of offensive rebounds and foul shots. No player was more aggressive or effective as she was on the offensive boards. Kaleigh also ran the floor as well as any player on the team, and defensively she played a key role in the Lady Devils’ effective full court pressure, averaging just under three steals per game. Following the season she was selected for the elite Standard-Times Super Team. That basketball season followed a triumphant volleyball season for Kaleigh who earned the first of back-to-back Super Team honors as he leader of a very strong Blue Devils team. In her senior year Kaleigh was a consistent force in Fairhaven’s powerful front line, finishing with 199 kills for a team that went undefeated in the South Coast Conference and reached the MIAA Division 2 South Sectional Finals. Over her three year Varsity Volleyball career Kaleigh finished with an unofficial school record 563 kills. Kaleigh demonstrated her athletic versatility by participating in two other sports while at FHS. During her freshman year she finished first in the 400 meter race and was fourth in the long jump at the 2005 South Coast Conference Freshman/Sophomore Track & Field Meet at GNB Voc-Tech, and in the spring she was a key performer on the Girls’ Lacrosse team. But basketball was where Kaleigh continued to shine on the collegiate level. Playing her natural guard position for the Worcester State College team, Kaleigh was able to focus more on her scoring and passing and in January 2012 she became the 17th Lancer to score 1,000 career points. Kaleigh led her Worcester State teams in scoring in each of her last three seasons and she is on that school’s all-time top 10 scoring list.